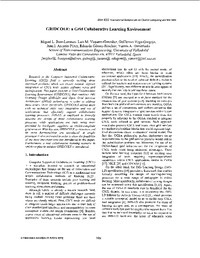 Research in the Computer Supported Collaborative Leaming (CSCL) field is currently tackling three important prohlems which are closely related: dijjjcult integration of CSCL tools. scarce sofmare reuse and technificotion. This paper presents a Grid Collahorative Learning Environment (GRIDCOLE) that combines IMS Leaming Design (IMS-LD) and Open Grid Senices Architecture (OGSA) technologies in order to address these issues. More specifcal!v. GRIDCOLE allows users with no technical skills easy integration and use of applications that e$’ectively support collahorative leaming processes. IMS-LD is employed to formally describe the desi@ of these collaborative learning processes while applications are built using tools provided by third-pary suppliers as OGSA-compliant grid service.^ With this aim, GRIDCOLE architecture and ifs main functionalities are introduced. A simple protofype is also presented in order to show the feasihilig of the most important concepb introduced in this paper. Furthermore, a real collaborative learning scenario in which we plan to validate GRIDCOLE is introduced.